Gardening Decor & Supplies From £10 At Wickes - Fencing, Compost, Paving & More! It's time to spruce up your garden! A great range of products from just £10 at Wickes. Check out the deals on laminate flooring this spring at Wickes! Don't stress about delivery, get it for free on orders over £75! Don't miss out on these discounts on tiles at Wickes. Great for storage in the garden and now with up to £200 off at Wickes. A new season marks a time for change. Check out the huge range of paints, wallpaper and other decorating supplies at Wickes. Why pay for delivery when you can collect from store for free? See website for full terms and conditions. Dab your hand in a little DIY this spring with Wickes. Have a little light bulb moment, with great quality lighting from Wickes. Take the bargains on Wickes lines which are low on stock and save massively. Remember these products sell fast. Find great savings on windows and doors at Wickes. This discount code expired on 20/04/2019 BST. Kit out your kitchen with great ready to fit furniture at Wickes. See website for full terms and conditions. This discount code expired on 08/04/2019 BST. Buy 5 or more units and get 50% off fitted kitchen orders. See website for full terms and conditions. Revamp your decking this spring with this deal on timber deck boards at Wickes. Freshen up your bathroom with 15% off at Wickes. See website for full terms and conditions. Just a few simple steps can save you a 10% every time you shop. Join the new TradePro program and get access to unique offers, discounts and other great benefits at Wickes. This discount code expired on 30/03/2019 BST. Transform your kitchen with these modern units at Wickes, now 50% cheaper when you purchase 5 or more. Get the bathroom up and running without a sweat. Bathroom installation service is now 20% cheaper for some time. This discount code expired on 25/02/2019 BST. We all like to get our houses in order over the summer and making use of a Wickes discount code from Groupon is the ideal way to do it. Whether you are redecorating, renovating or working on your garden this summer, here are some of the ways that Wickes can help you to improve your home. How can Wickes help with my guttering? Wickes can help with your guttering needs in a number of ways. From snapping up all the guttering essentials you need at a great price thanks to Groupon discount codes, to their How to fit or Repair Guttering guide that can help you through every step of the process. Do Wickes cater for conservatories? If you are thinking about building a new conservatory this summer then make the most of the great deals available at Wickes. As well as providing a great range of beautiful conservatories, you can also pick up roofing, door fittings and more. With deals offering as much as £1000 off conservatories, visiting Groupon should be your first stop before Wickes. From tool sets to tend your food to covers for keeping your barbecue in great shape over the winter months, you'll be everybody's favourite this summer. What else do Wickes sell that can make my summer easier? When the sun comes out we all feel the urge to get out into our gardens. Whether you are looking to completely renovate your garden into your own private oasis of calm or are just looking to clear it up and maintain the hard work you’ve already put in, Wickes are here to help. Using Groupon discount codes for Wickes can help to save you money on a wide range of gardening and landscaping items, making it easier for you to get everything you need from one place while saving money. Do you need a shed to store gardening equipment, BBQs or lawnmowers? Wickes have you sorted with an excellent variety of shapes and sizes to fill your needs. Follow their Build a Shed tutorial video to see exactly how you can build your shed in a way that it will stand up to the elements. With insulation foil, shed and fence treatment and a whole lot more available at Wickes this summer, all your shed problems will be solved. Is decking easy to lay? Have you been thinking about getting decking in your garden but are worried that it might be too difficult? With Wickes you can buy everything you need to lay the perfect deck as well as follow their instructions and guides that will help you do it to a professional standard. Search our great Groupon deals to see what savings you can make on decking, posts, handrails, lighting and specialist treatments. We know it’s called DIY but Wickes is still here to lend a helping hand. The home improvement retailer is the only friend you need when it comes to fixing up your kitchen, bathroom and other rooms as well as your garden and landscaping requirements. 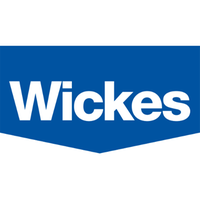 Wickes has been a leading name in the UK market for over 40 years, supplying tradesmen and DIY lovers with all the materials they need to start and finish a home project. Now Wickes and Groupon have teamed up to get customers even better deals on their home improvement needs. Whether you’re after the small stuff like nails and screws or want a full-blown kitchen unit delivered to you, you can bag yourself some big savings with Groupon’s voucher codes on Wickes’ products. •	Shop – Under this section you’ll find all the products sold by Wickes, which are all of a trade quality standard with prices that will save you a fortune by the time you’ve finished your project. o	Kitchens – Everything you could possibly need for your kitchen is covered here. You can browse the showroom and see what kitchen you fancy cooking in from now on. You can even get a free design consultation if you’re really stuck. If you’re just looking for individual kitchen items then check out the appliances, sinks, taps and tiles available. o	Bathrooms – Similar to the range of kitchens, you can get a free consultation to help you decide on the bathroom you want. You can also get accessories for your shower and bath, as well as basins and radiators. o	Building materials – This section does exactly what it says on the tin. Any and all materials you need for building work is here, including bricks, cement, corrugated sheets, cladding, timber, insulation, mouldings and water and damp proofing. o	Garden & Landscaping – Fancy turning your garden into your own mini park? There are tons of Wickes’ materials which you can spruce up your garden with, from fencing to make your garden’s surroundings safer and more pleasing on the eye, to pet enclosures like kennels and chicken coops. o	Flooring – Feel like your carpet needs an update? Why not shop Wickes’ range of wooden and laminate flooring for a stylish look and convenient use. •	Ideas & Advice – Stuck on a project and need some tips on how to get the job done? There’s great advice on how to fix your fencing, how to lay a deck, lay a patio, change a plug socket, fit shelves, technique for painting a room any many more guides, some of which include video help so you can follow it step-by-step no problem. Any perks or deals on the Wickes’ website I should keep an eye out for? If you’re looking for a deal, check out the Offers section for all the latest offers on kitchens, bathrooms, flooring and other materials. Recently, there are offers like half price on laminate flooring, 2 for £18 on Wickes coloured emulsion and 20% off selected ready to fit kitchens. What products should I be looking for at Wickes? There are products for every possible DIY job at Wickes, so while it depends on what you are looking for, there’s no doubt that you’ll find the right tool for the job. In terms of general tools and work wear, you can get yourself ladders, screwdrivers, drills, hammers and saws. Want a brand new fire fitted in time for winter? You can choose a gas, electric or coal and log fire. Feel like your home needs to be more secure? Wickes sells locks for your doors and windows as well as alarms, security lights, CCTV and safes. What Wickes discount codes does Groupon have? The exact deals will change from time to time but all are made to bag you big savings on Wickes’ products. What Wickes voucher codes are popular at Groupon right now? Our most popular voucher codes for Wickes include deals like up to 30% off garden offers, up to half price on selected power tools and 3 for 2 on selected interior doors. Our vouchers codes are updated regularly so keep checking the page for any new offers. Some of our recently expired offers for Wickes include 50% off tiles and 10% off roof repair. How do I redeem my preferred Wickes voucher code? Now that Wickes has made your DIY experience as easy as pie, it’s time for Groupon to make your voucher experience just as easy. All you have to do is click on the voucher you’d like to redeem, hit the green Shop Now button that appears and you’ll be taken straight to the Wickes website with the deal already in place while you shop. If you click on the voucher and the green button displayed is Copy Code, hit that for the code to be copied and simply paste it once you’re at the Wickes checkout. Some deals and offers can reach an expiry date as they’re replaced by new, up-to-date vouchers, so it’s important to keep an eye on when a deal runs out so you don’t miss out on a big saving. To keep track of this, simply check the bottom left part of the voucher where the expiry date will be displayed. It’s worth checking out the expired discount codes area just below the updated vouchers, as occasionally deals are extended passed the expiry date and can be used on the stores site. Under the Related Stores heading on the left-hand side of the page, you’ll see a number of stores which offer similar products with similar deals and discount codes.